Beautytiptoday.com: Are You A Winter, Summer, Spring, Or Autumn When It Comes To Makeup? Are You A Winter, Summer, Spring, Or Autumn When It Comes To Makeup? Have you ever heard someone tell you, "You're definitely a winter." Or, "That makeup shade is good for autumns." 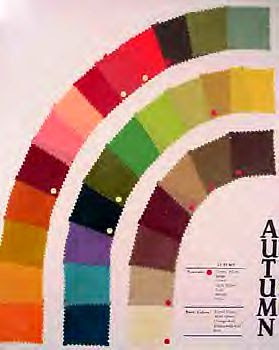 That is a beauty science, if you will, called seasonal color analysis. It was a very popular makeup theory that was developed in the early 1980's. That's where hair color, skin tone, and eye color all play a big role in determining what colors go perfectly for you. 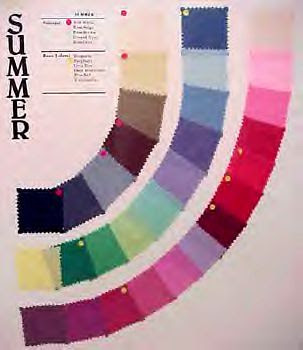 As archaic as seasonal color analysis might appear to many these days, we believe the color profiles for each and every woman, do hold merit. And at this moment, there are still many seasonal color analysts out there who can help you find the best colors for you. There are also several how-to books on the subject. The book we are looking at today, is by Carol Thompson. "Secrets to a Beautiful You." If you think about it, don't certain shades look better on you? For instance, maybe you like how you appear better in white, rather than a creamy, yellow ivory? Or maybe fuchsia lipstick looks almost garish on you. Or pastels just 'don't do' anything for you, and so on. According to the color experts, we are all born with either a yellow undertone (warm) or a blue undertone (cool). 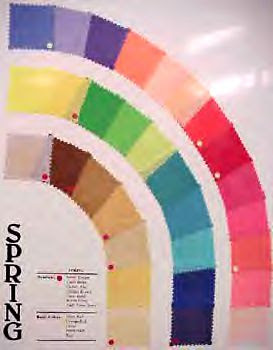 The SPRING palette consists of clear, warm colors all with yellow undertones. OMG! I was born in 1984 so I had never knew about this color thing. But what a cool idea. My mother remembers the 4 seasons color thing. I think Im a spring. Good for you, Fay. I am definitely a winter----I even look better in silver jewelry than gold jewelry. But I think you can also be a combo of 2 seasons. 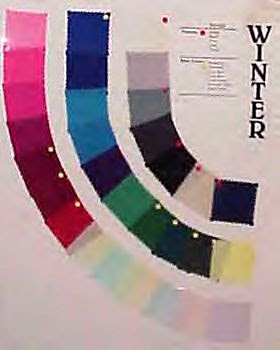 how do i know my if i'm winter, summer, spring or autumn? i have dark brown eyes dark brown hair, almost black, beige skin or asian skin,,not really white but mostly on the brown side..
Angelica, you are most likely a Winter. I'm a spring. Some beauty specialists also ask what color your hair was when you were three-five years of age and mine was light brown. I look better in cool tones, silver jewellery, I don't know if I am a winter or a summer. I have light brown hair that is prematurely greying with a grey streak in front, I have fair, pinkish skin especially high cheek color. I have Blue/green eyes. I seem to be drawn to winter colors. I think pure white looks good on me and I like lots of strong colors, various shades of purple, berry, burgundy, and various shades of blue and navy. Any ideas? I have a lot of trouble doing my own season. What do you think I could be? I have very fair skin with a fragile translucent quality. The shade is a whitish olive, not pinkish. My eyes are dark brown. My hair is a medium deep ashy chestnut. My cheeks are naturally pink. I sure need some help. Thanks so much! I'm not sure what I am. I have fair skin with pink undertones and dark blue eyes. When I was younger I had very blonde hair, now it's brown but i dye it blonde. What am I? i have blonde hair, light green eyes with some blue in them, and very pale skin with pink undertones. which season am i? im not sure which one i am. i think i may be a spring, i definately have a yellow undertone. i have medium brown hair, fair skin (one of my parents is all white and my father is part black but mostly white), and dark brown eyes. I'm a summer...I had light blond hair as a child, gray-blue eyes and almost transluscent, fair skin. Now my natural hair color is a dark ash "mousy" blond--almost brown, but I get it highlighted. I look best in the "summer" color palette of pastels and muted, smokey cool colors: muted pinks, blues, purples, grays, and off-white, and silver jewelry. It sure saves me a lot of time when I shop! i dont know what i am. i have green eyes. tanish olive skin color. and dark brown hair. You sound like you are either an Autumn or a Winter. It will come down to whether cooler or warmer colors work best on your skintone. Hope that helped. I dunno what I would be. I tend to wear colour in the autumn or spring palette. I have pale skin, not pinkish though, hazel eyes, and copperyish light brown hair. Any idea? Taryl, you sound like you are a spring. Don't know where I fit. although deep pink looks good too... It's very confusing. I'd really like to nail it precisely to stop wasting money on cosmetics that are a failure. I wear bronze or deep red/pink (rouge) lipstick. Help! Where do I fit? I have been at this for quite some time.My mother had the book and was convinced that I was a winter but pure white makes me look even more pale and bloated. I did the white paper test and my skin tone was just a touch yellow as opposed to pink which from what I understand, means that I am a warm tone.I also have olive green eyes with some orange star burst action and a navy rim around the iris.My hair was a light to medium brown with gold and red highlights as a child and now it's a deep chestnut brown with deep red tones when the sun hits it.Every quiz I have taken so far gives me a different answer.Can anybody help? I also have a pic if that would help.Thanks in advance.